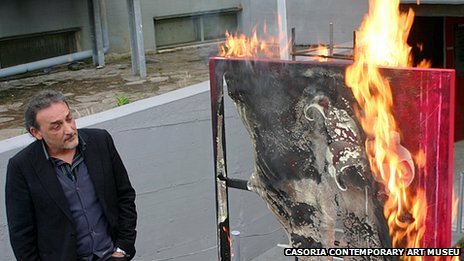 On Friday 25th May I took part in an art burning at Blake college following the action taken by Antonio Manfredi at the Casoria Contemporary Art Museum in Naples who is responding to the arts cuts in Italy by demonstrating the literal danger in which these cuts place art by burning artworks. He began by burning his own work, has burned others with the consent of the artists and has said he will burn three works a week until he is listened to. Many people around the world have now joined in what Manfredi has called the CAM Art War. “Our 1,000 artworks are headed for destruction anyway because of the government’s indifference,” says Manfredi. Antonio Manfredi burning his own work. Burning art, like burning books, is an emotional statement. It causes people to pay attention to works that they might otherwise have considered themselves indifferent to because it becomes symbolic of the freedom, proliferation, expression, communication and continued existence and growth of creative culture. Each individual loss suggests the impoverishment of our cultural experience. For my own part, I believe that we may, in fact, need some destruction or disintegration in our artistic culture – but as a process of catharsis, out of an awareness of the role of art and creation in helping us to understand, and to come to terms with the condition of life, not as a consequence of indifference. The goal of preservation for all art can be stultifying and there is a catharsis and undeniable sense of life that comes from ephemeral work. But lazy and indifferent preservation can be as destructive to artistic culture as negligence or obstruction. During the burning I sang a song about the need for destruction in creation, the imperfect, transient and incomplete nature of lived life, which all art celebrates and struggles with, and which, if forgotten, robs art of so much of it’s power and meaning. Ephemeral art acknowledges this by its cycle of doing and undoing whether violent of gentle. Rather than becoming a distant, and dangerously dead thing, looked at through the filters of history, white gallery walls, gilded frames, academic accolades or bullet proof glass, meaning is rejuvenated and re-created, it is tied to the momentary meaning of life with which we necessarily live, by the urgency of its existence and loss. For me, the art burn is saying, as for Manfredi “look what is being lost”, to remind people that, as Gerhart Richter has said, art is needed for survival, “like bread, like love”. But it is also saying that each destruction calls for a creation… do not only care for the stores and archives of art, the outermost layers of the creative body… as each skin falls away, beneath it is another and another and another… they are irrepressibly growing out of the un-graspable core… the healthier that core, the faster and the thicker they will fall, constantly replenished. The skins are beautiful, care for them as you will, make a museum of art, but not of creation – don’t forget the living core, all living things need sustenance, and the creative body needs creative culture, not only cultural artefacts. I wrote this song a couple of years ago, it is played in the Blake College CAM Art War video. Keep this not for art. Keep this not for me. As our lives must be. Let it fall apart, falling down like leaves.